Ever played on a multiplayer server, built near other players and when returning from the Nether, surprisingly found yourself in another player's base? It's because of the 8:1 block ratio between the Nether and the Overworld. It's really weird though that you enter a portal in the overworld, and then when going back through where you came. come out of a different portal in the overworld. 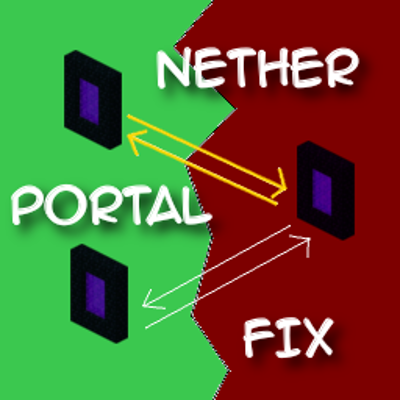 This mod fixes that issue. This mod only needs to be installed on the server (but it works in singleplayer as well). If you are using SpongeForge, make sure to use the latest version of both this mod and Sponge! It should be compatible now. Yeah, I'm dumb and forgot to specify the access transformer as usual. Uploaded a fixed build, awaiting Curse approval. Should be available any time now. Sorry about that. You are the best person alive Blay09! Wow... it was about time! Great mod! A much needed fix! Would you be so kind as to do a 1.7.10 back port, please?